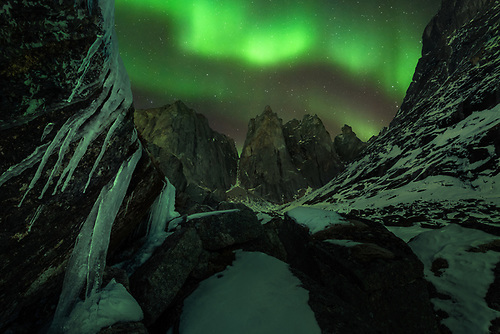 I made my first trip to the Ogilvie Mountains in 2012, and for the first time photographed (and watched) the aurora borealis dance across the sky, above some of the most impressive peaks and spires I have ever seen. 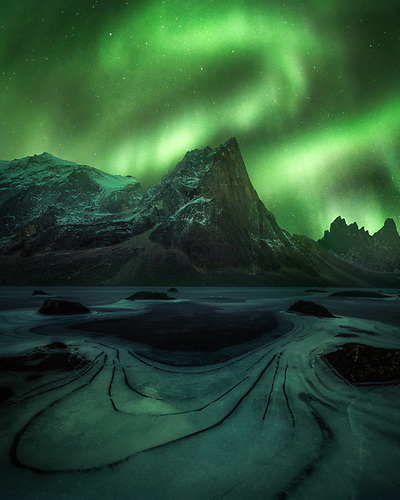 A still photograph can never capture the dynamic nature of the northern lights. On a good night, one is treated to a 360 degree view of dancing green, red, and magenta hues, all beneath a clear, starry sky. It was fall then, with a beautiful blanket of autumn tundra across the ground. For over 5 years, I had planned to return in winter, when the fall colors had faded, and fresh snow, frozen lakes, and white peaks imported a distinctly different character to the landscape. The area was barely recognizable from what I remember, but it was beautiful. The nights were cold. Very cold. The rivers, streams and lakes were frozen, requiring several hours a day boiling snow for drinking water. I spent 7 nights on a helicopter-in, helicopter out backpacking trip through the range. I stayed up at night in wind chill conditions of -15 watching the most breathtaking natural phenomena display right in front of me. 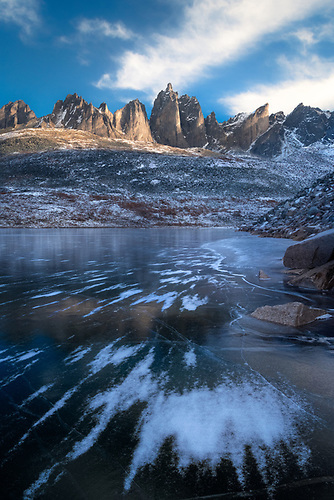 I camped at the base of some of the world’s most visually impressive peaks. I slept through blizzards and hiked through knee deep snow, over slippery talus rock, across frozen rivers and through dense brush. I captured photographs I consider some of my most visually appealing, but that are also more meaningful to me then most I have ever taken. 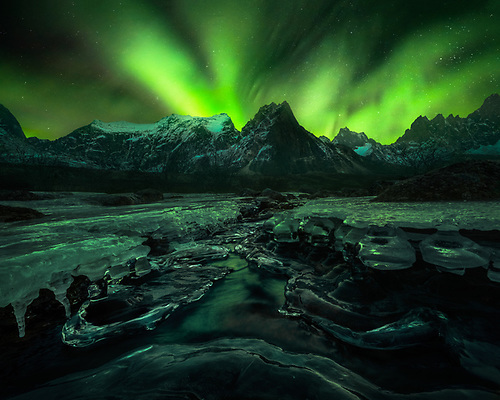 My top ten photos for 2018 are all from my expedition to this area ... a rarely seen landscape dressed in snow, lit by the eruption of the aurora, all while the earth sleeps. The blowing snow on the frozen surface of Talus Lake, with soft light on Mt. Monolith, shot on a very windy winter day. 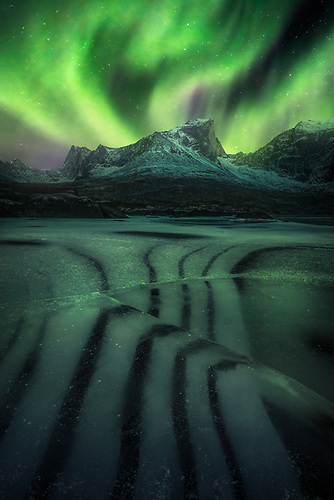 Interesting patterns just under the translucent surface of this frozen lake wind around the landscape while the northern lights dance in the sky. 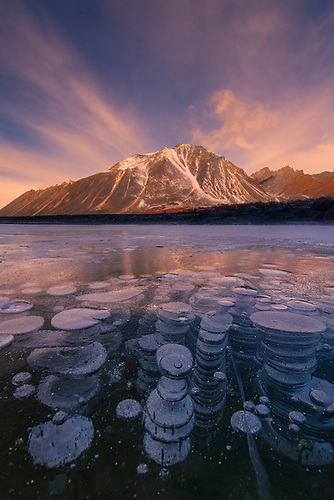 Number 8: "Etched in Time"
An interesting array of methane gas bubbles trapped in a frozen lake, complemented by a colorful sky and reflected peaks in Yukon’s Ogilvie Mountains. Number 7: "Frozen in Time"
Icicles and a frozen landscape frame the aurora exploding in the sky, shot from the base of Mt. Monolith in the Tombstone Mountains. 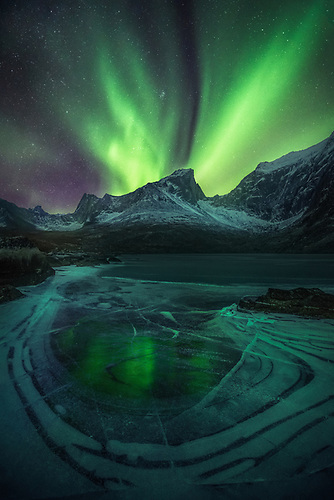 These leading lines created by freezing conditions and snowdrift just under the surface of a frozen lakeshore provide the perfect foreground to an explosive display of aurora in the sky. With wind chill, the temperature was near -15F at night. 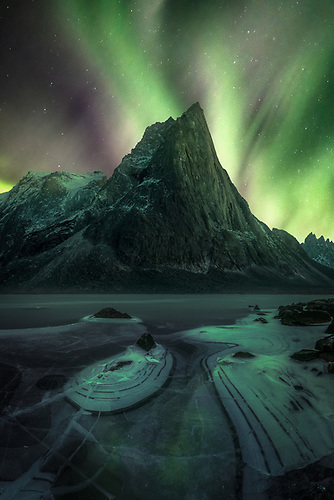 Number 5: "Total Eclipse of the Night"
A small stream leads through the otherwise frozen landscape, punctuated with icicles and ice bells, towards this unnamed peak in Canada’s far north. 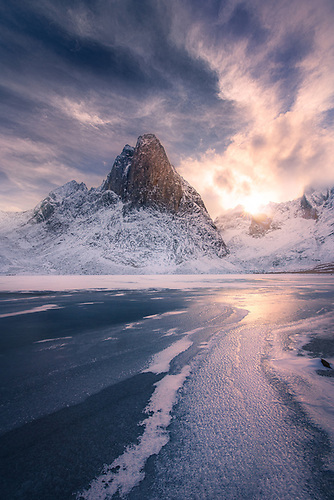 A natural S-curve created by ice and blowing snow lead to a beautiful sunstar and colorful sky behind Shark’s Tooth, reflected in a frozen lake beneath. 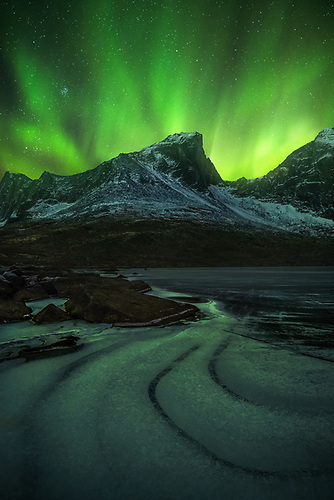 Number 3: "While the Earth Sleeps"
Number 2: "Cold Light of Night"
One of many unforgettable auroral displays over the a frozen lake and majestic peaks of the Yukon Territory in early winter. In over ten years of photographing the world's most breathtaking and wild landscapes, some moments I will never forget. This is one of them. Such an incredibly beautiful collection, Chris. Looks like you had one amazing year. I really like Resurgence (#4). Such great light, beautiful subtle tones, and strong contrast and drama. I hope 2019 is another great year for you. ©Chris Moore. Powered by Blogger.